It's Friday and nothing is working out for me. Suddenly, EXPO. Toronado posts that it's tapping a fresh batch of Alpine Exponential Hoppiness (Expo). OK, day over at 3pm. This is one big mother effin IPA, but it's so well done that you wouldn't be able to tell it's 11.25% had you not asked. Despite the huge malt backbone, it's so well-hopped it's a minor detail and you get to focus on the beer. Because, most breweries can't even do a double IPA well (e.g. 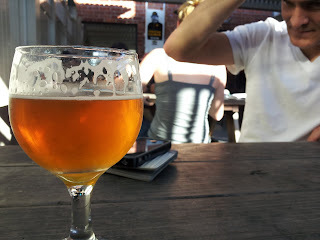 Laughing Dog), it seems clear that the folks at Alpine are clearly some of the most talented brewers in San Diego county (e.g. Nelson, and this obviously).